Nigerian musician and Alter Plate Boss, Harrysong has showed off his the inside of his expensive mansion. The musician also showed his car garage of expensive cars. 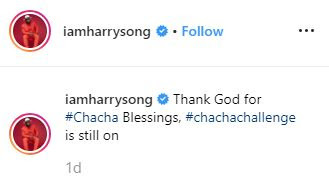 Sharing the photos, he wrote: "He makes everything #Chacha in his time 🏤🏚 Next #Chacha 🏎 Next #Chacha 🛩"